Ethelda Bay-Tennant Island Conservancy protects a small group of islands and marine environment in the Estevan Group, between Barnard Island and Trutch Island in the Hecate Lowlands and North Coast Fjords Ecosections. Access to this area is usually made by boat and the conservancy contains safe boat anchorages and small beaches. 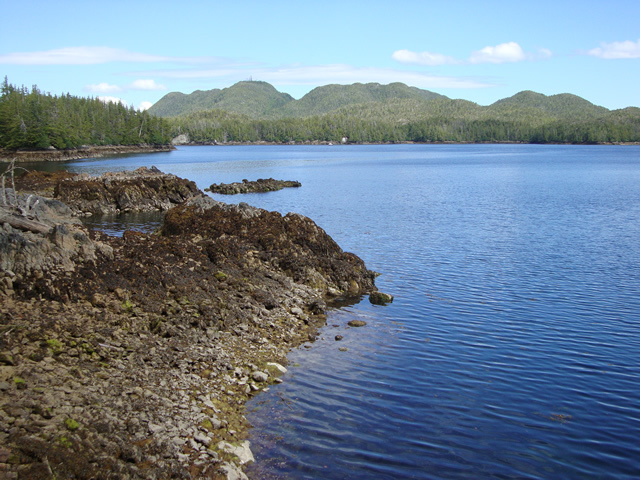 Ethelda Bay-Tennant Island Conservancy is only accessible by boat or float plane and is located approximately 50 km SW of Hartley Bay and 130 km SW of Kitimat. It is located in Langley Passage, between Estevan Sound and Hecate Strait. Reference: Marine Chart #3795 (Langley Passage-Estevan Group). Reference: 1:50,000 scale Topographic Map #103 H/4 (Trutch Island). History: Ethelda Bay-Tennant Island Conservancy was designated as a conservancy on May 31, 2007 following recommendations from the North Coast Land and Resource Management Plan. Ethelda Bay was the site of a former manned radio beacon station (operated by the DOT, Ottawa) where a maintenance crew was once housed. A private couple purchased the houses, dock, generator station, and helicopter pad from the federal government in 1996 to develop a tourist and fishing lodge. Cultural Heritage: The conservancy is in the asserted traditional territory of the Gitxaala First Nation. There are no known archaeological sites in the conservancy. Use the below link for more information or to contact this First Nation. Conservation: The conservancy protects small representative islands and marine environment along the northern mainland coast, including undisturbed old-growth forests, fish and wildlife habitat. Wildlife: Black bears, wolves, waterfowl, eagles, and salmon can be seen in the conservancy. Humpback whales, killer whales, Dall’s porpoises, Pacific white-sided dolphins, sea lions and harbour seals can also be seen in the adjacent marine waters. Canoeists or kayakers may enjoy exploring the small islands, inlets, bays and shorelines in this conservancy. There are opportunities for salmon fishing in this conservancy. Please consult the appropriate non-tidal fishing regulations for more information. Anyone fishing or angling in British Columbia must have an appropriate license. This conservancy is open to hunting during lawful hunting seasons. Please check the BC Hunting & Trapping Regulations Synopsis for more information. Black bears, wolves, waterfowl, eagles, and salmon can be seen in the conservancy. Humpback whales, killer whales, Dall’s porpoises, Pacific white-sided dolphins, sea lions and harbour seals can also be seen in the adjacent marine waters. Firewood and campfire rings are not provided. If you must have a fire, please burn only dead and down wood, and be sure to fully extinguish the fire when done and spread out the ashes and rocks. Dead wood is an important habitat element for many plants and animals and it adds organic matter to the soil so please use it conservatively, if at all. We encourage visitors to conserve wood and protect the environment by minimizing the use of campfires and using camp stoves instead. Limited burning hours or campfire bans may be implemented during extremely hot weather conditions. Note: The private property, buildings and dock on the south-west side of Ethelda Bay are not part of the conservancy.